In the second issue of the third mini-series Amethyst confronts Mordu, Donal finds Topaz keep changed in his absence, and Emmy gets an unwelcome surprise back on Earth. 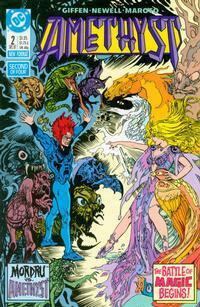 The cover of the issue shows Amethyst and Mordu gearing up for magical battle. 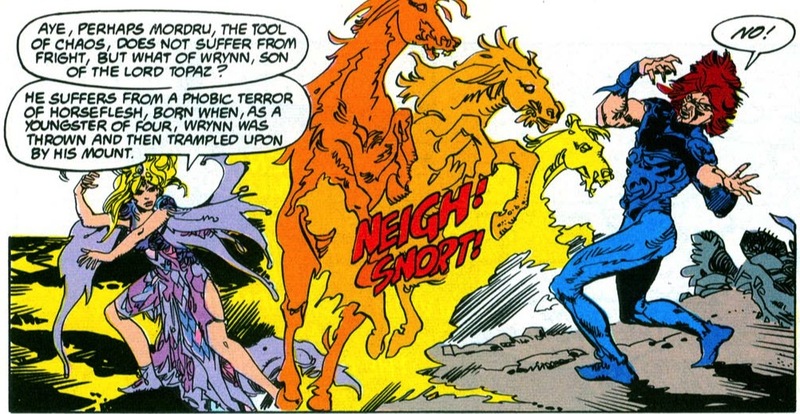 Wrynn, the former heir of Turquoise, has given his soul over to chaos and has become their servant Mordru. He walks through a desolate landscape, with dark magic and the occasional lizard skeleton as his only companions. In White Opal’s forest Amethyst communes with a couple of fantastical birds. The dark thing that Opal was sensing manifests before anyone was expecting it to, as Flaw suddenly appears. He’s inanimate though, and Amethyst says that he’s a sign of Chaos’ challenge towards her. She says that “the true contest will be fought on dearer ground to thee, Donal. And the blood spilt will be thy b-” Donal interrupts her by yelling no and runs off, vowing to give every drop of blood in his body before he lets evil in the house of Topaz. Opal wonders why Amethyst didn’t stop him, saying that she’s provoked the boy to face his own death. Amethyst says that she can’t prevent his destiny and order demands a sacrifice. Opal says that he doesn’t want to hear the words of a Lord of Order, he wants to talk to Amethyst because she would find a way to save both brothers. 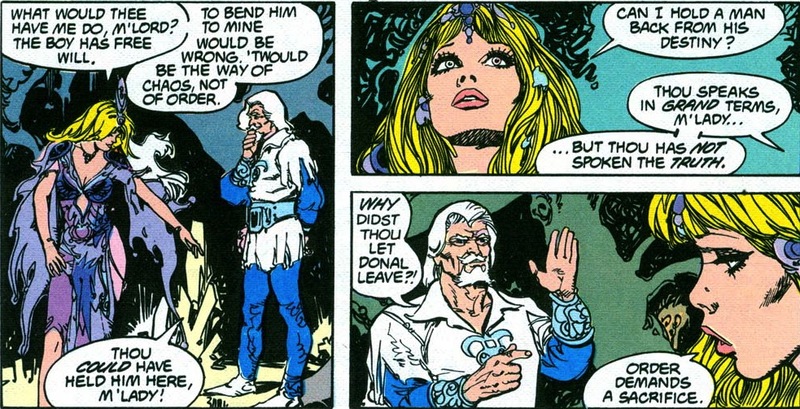 Amethyst says that she may be able to save Wrynn from Mordru. Amethyst and Opal walk off together. The Lords of Chaos are enraged at what they see when spying on Amethyst. They comment that The Child is sending his pets to retrieve a deserter – Emmy on Earth. She comes home with some groceries and goes to visit her husband in the bedroom. When she pulls the covers back, she sees a cavity in his chest, and a creature steps out of the shadows to taunt her. 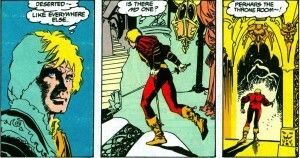 Donal returns home, only to find Topaz Keep deserted. When he enters the throne room he finds it full of distorted souls, screaming for help. Amethyst and White Opal confront Mordu. Amethyst tells Wrynn that he can still be saved. Mordu proclaims “I am Mordu, scion to thy enemies, the dark lords of Chaos!” Amethyst says that the only way she might be able to save Wrynn is to release his soul by killing Mordu’s body. Mordu summons up a dragon which Amethyst defeats. She summons up a horse of fire in an attempt to speak to Wrynn’s phobia of horses. Donal finds his little sister Amber in Topaz Keep. 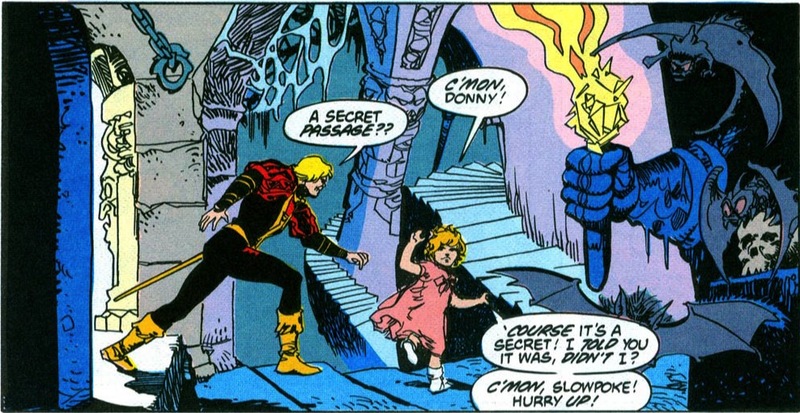 She tells him that Mommy and Daddy are with her and leads Donal through a secret passageway. 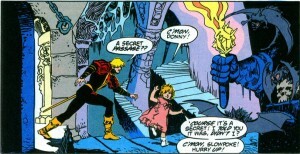 Amethyst still continues to appeal to Wrynn as she battles Mordru. He says that only Mordru of Chaos is left. Mordu says that Amethyst will have to kill him in order to save the Gemworld, and she doesn’t have what it takes. He disappears through a mystical portal, laughing that Amethyst has failed against chaos a second time. Yikes! That was quite the cliffhanger. I am still not able to entirely get into this series. I found the choice to have the Gemworld folk speak in pseudo archaic language offputting, since the dialog was much more colloquial in the earlier series. Also, Amethyst as Goddess/Lord of Order loses the whimsical charm and sense of humor of Amy Winston. I miss Amy. This entry was posted in comics and tagged Amethyst Princess of Gemworld on 7/25/2009 by Anna.